As the world becomes increasingly connected, cyber-attacks continue to grow in scale and severity. Organizations today are utilizing technology in day-to-day business to advance sales, power innovation, increase efficiency, and facilitate data and analytics. The financial security risks and reputational damage associated with this technology revolution have made it crucial for organizations to establish an effective data privacy and cyber-risk management strategy. To achieve cyber resilience, as well as a strong balance sheet and reputation protection, forward-thinking companies are taking proactive steps to explore and understand their vulnerabilities. 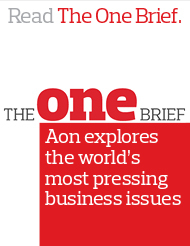 Aon has created a simple-to-use, interactive Cyber Risk Diagnostic tool to help you identify and evaluate the key internal and external factors that may affect your levels of cyber risks. Security budgets today only address a portion of cyber vulnerabilities organizations face and often leave gaps the ability to confront the threat of a data breach. Aon's latest cyber solution, Aon Cyber Link, offers privacy breach response management services and information security insurance designed to assist organizations at every stage of a data breach. Don't wait until "if" turns into "when" for your organization to confront the threat of a data breach. Learn more about our Privacy Breach and Information Security Insurance. Receive a free cyber-coverage quote today! The worldwide WannaCry ransomware attack of May 2017 was by all accounts was one of the most widespread cyber events we have seen thus far. The pace at which the malware proliferated and the scope of the impact across companies worldwide was unprecedented. Understanding the nature and impact of this event can provide businesses with invaluable lessons on how to improve their security strategies and mitigate the risk of future cyber-attacks.